Walther Arms has been around for decades and the legendary company has stayed relevant part and parcel of their revolutionary collection of modern CCWs. Nevertheless, after spending quality time with some of their firearms, I found some significant letdowns in addition to the expected big hits. While I was more than impressed with the P22 and its remarkably intuitive design, I was surprised to find the iconic PPK disappointing. Although the PPQ resembles the older P99, Walther Arms made a few key modifications which have made it a popular sidearm choice for military and law enforcement personnel. The German firearms developer currently manufactures several variants of the PPQ, but in this Gunivore rundown, we’re going to be focusing primarily on the .45 caliber model. As one of the most impressive big-bore self-loaders on the market, I was less than surprised to find out that the PPQ45 won the NRA American Rifleman’s Golden Bullseye Award for Handgun of the Year (2017). In receiving this prestigious honor, the PPQ entered into the same category as perennial favorites like the Springfield XD-S and the Sig Sauer P320. Walther Arms is known for their extraordinary pistol designs, and the PPQ may just be their finest yet. 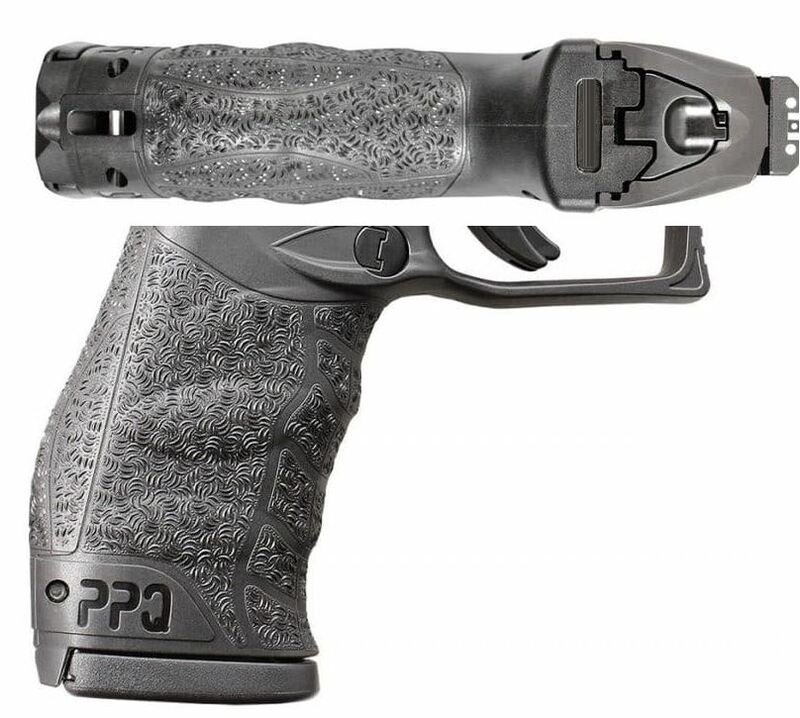 As the first thing people notice when picking up a PPQ, I want to begin with their outstanding, ergonomic grips. 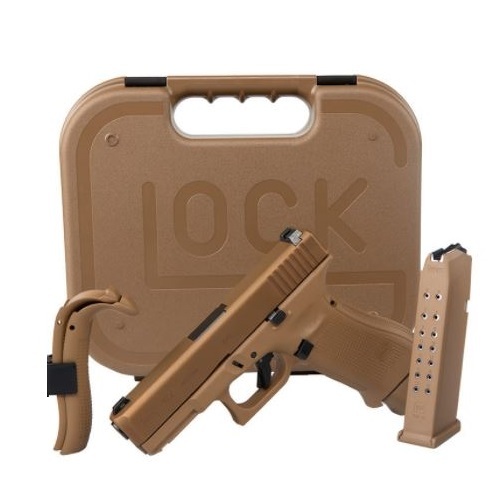 These non-slip, cross-directional intuitive grips not only provide the shooter with a more comfortable grasp but also function as serious control-boosters. Whereas most competitive .45 cals are unwieldy, Walther further perfected the PPQ’s handling by adjusting the angle of the grip to the slide. But that’s not all; the confidence-boosting PPQ grip also comes with three easily interchangeable backstraps (small, medium, & large) to provide that premium customizable fit all shooters love. Unlike the P22, the .45 PPQ features the American-style mag release conveniently positioned for easy ambidextrous use. 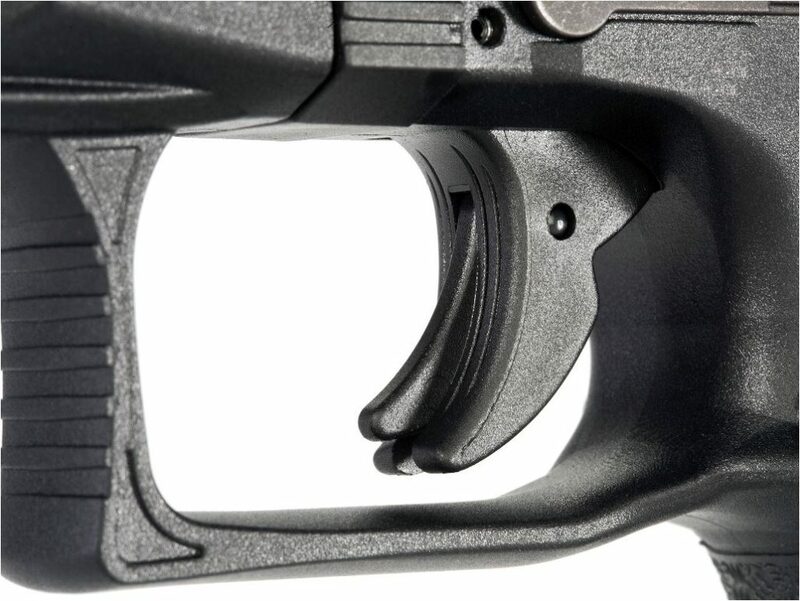 Likewise, in sticking with their modern construction, Walther incorporated an extended ambidextrous slide stop that locks back on empty. Although often overlooked, this is one of my favorite parts of the gun. Furthermore, the PPQ features three internal safeties including a firing pin block and two drop safeties, which make it a safe and ideal carry weapon. Next, let’s move on to the PPQ’s user-friendly slide. The innovative German weapons producer kept with the popular front and rear slide serrations but added a durability-boosting Tenifer coating and matte finish. Nonetheless, it’s what’s in and around the resilient slide that grabbed my attention. Besides for a convenient Picatinny rail and polygonal rifled barrel, the PPQ contains one of the best pistol sights in its class. In addition to their low-profile, these 3-dot polymer sights are also windage adjustable. Even more, the accuracy-enhancing sight system even comes with optional night-friendly metal self-illumination sights. Last but definitely not least, we arrive at the PPQ’s beloved trigger system, for which it gets its name (Police Pistol Quick Defense Trigger). Unlike other Walthers, this .45 ACP semi-auto has no single-action capability. While some might find this to be a drawback, tons of shooters agree that the (approximate) 5.5 lb. trigger pull with 0.4” travel and 1” reset is well worth it. The reason these specs are more important than ever is because as a .45 cal, they significantly improve follow-up shot accuracy. To put it simply, the PPQ trigger is just heavenly. Designated as the Police Pistol Quick Defense Trigger, Walther’s PPQ was built for fast and reliable performance. 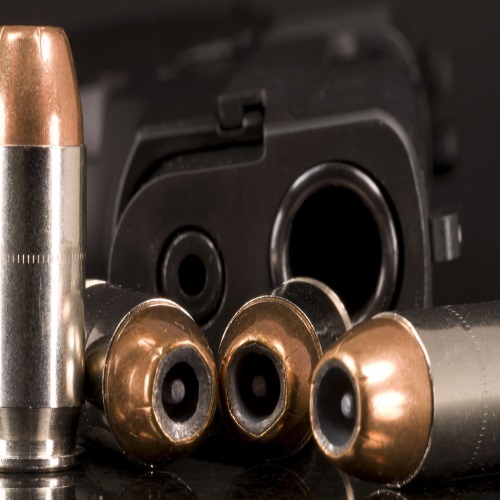 .45 ACP is one of the most popular defensive rounds, and reasonably so; nevertheless, many shooters tend to opt for a less powerful cartridge in exchange for more control. In a stroke of pure genius, Walther Arms has managed to eliminate all of the negative aspects of the classic heavy-hitting caliber. By improving the grips and trigger on the PPQ, in addition to modifying several internal components, the PPQ45 may just be the ultimate .45 CCW. Besides for easing the recoil and jump on the PPQ’s initial shot, Walther also solved the infamous issue of the high-powered caliber’s follow-up shots. In fact, if I had to sum up the PPQ’s performance in one sentence I would have to say that it’s quite simply fun and easy to shoot and it just won’t miss. But as crucial as handling and control are to a handgun’s overall performance, accuracy is arguably more important. That being the case, the PPQ45 is insanely accurate at insane distances. So much so, that the top-selling Walther can easily drop targets at up to 70 yards in the hands of the right shooter. Although this may be tougher for less-experienced shooters, the average shooter should still have remarkable accuracy even beyond 25 yards. You may also be interested in the Top Shooting Records, History’s Most Influential Firearms, & the Biggest Myths About Guns. My first impression of the 12-round steel PPQ mags was a bit shaky considering I had some trouble getting the 12th round in. It definitely got easier after a while but it was a piece of cake when I used a speedloader. Although I haven’t seen a lot of folks focusing on the PPQ’s magazines, the ability to easily-control a high-powered CCW and have 12 rounds makes the PPQ45 one of the best carry options around. After just a few minutes with the Walther PPQ45 I could see why it was chosen as the American Rifleman’s Handgun of the Year for 2017. 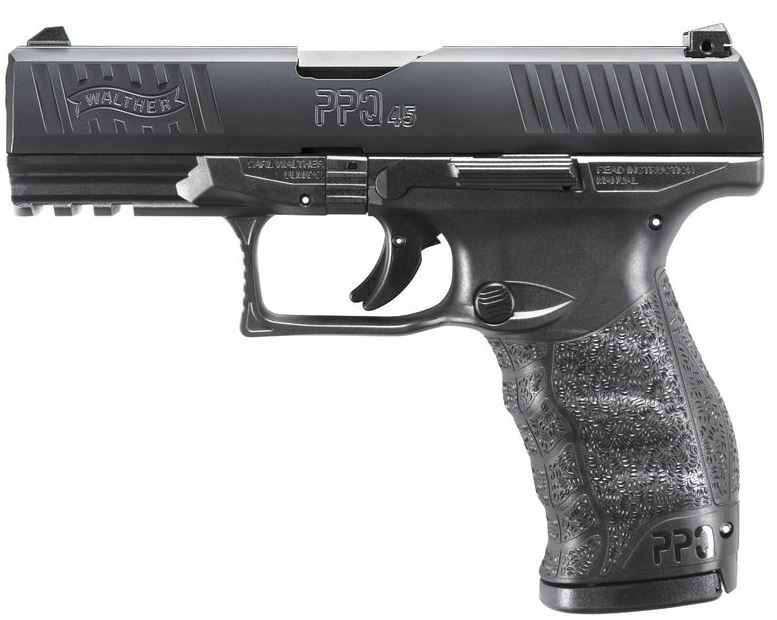 Besides for offering high-powered protection in an attractive design, the PPQ45 is simply remarkable from top to bottom. Although the $699 price tag may seem like a bit much, I can assure you it’s worth every penny! 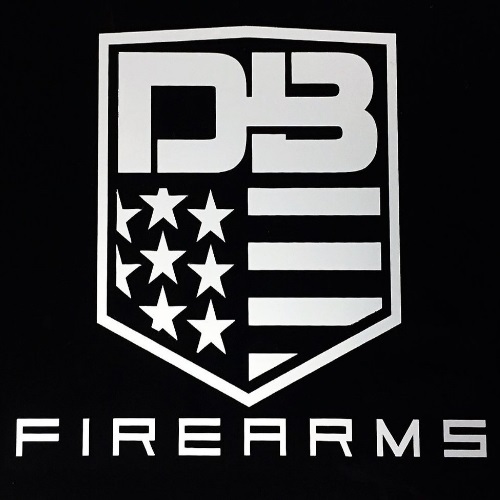 Don’t forget to check out our reviews of the Glock 19X, KRISS Vector Series, & the Charter Bulldog.